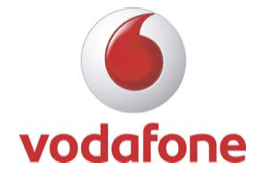 We have received word from Vodafone that their 4G price plans will be available to buy from Monday 12 August, although their 4G service won’t actually start rolling out until slightly later in the month on 29 August. 4G will be rolled out first in London, with 12 more cities going live by the end of the year. They are calling their 4G price plans “Vodafone Red 4G Ready”, and like EE have done with their 4G service, they are launching a choice of other entertainment services alongside that allow you to make the most of your new-found ultrafast connection. 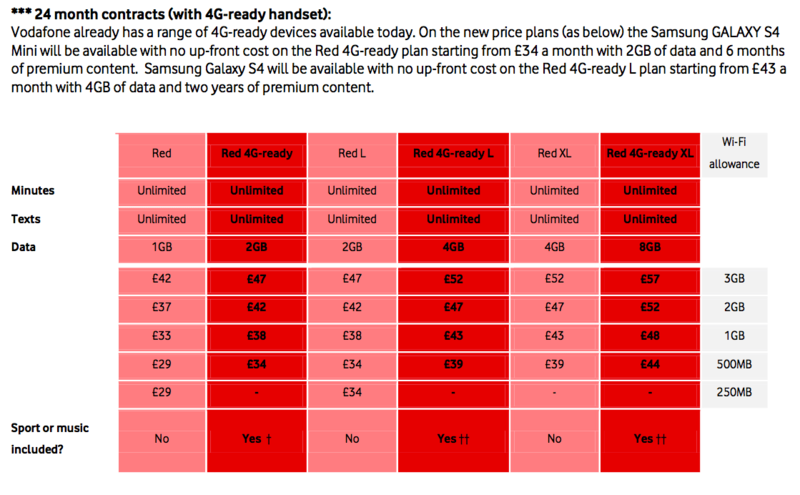 When you buy a Red 4G ready price-plan you also will get to choose whether you want either Spotify Premium or Sky Sports Mobile TV. They have also announced that any existing Vodafone customers who already have 4G-ready devices can enjoy the Spotify or Sky Sports Mobile TV offerings, plus double the mount of data they currently get and access to the ultrafast 4G service for just an extra £5 a month, without needing to sign-up to a new contract with Vodafone. This will be very welcome news to any existing Vodafone customers, and something that T-Mobile/Orange and EE should take note of…! Other announcements include plans for customers who want to use Vodafone’s 4G on their tablets and/or laptops and the release of 4G enabled dongles and Mobile WiFi hotspots to go with them. More info on these can be found in the full press release below. Finally, Vodafone have also introduced their 5 Star Care Service, which allows customers to back up their devices, remotely lock or wipe lost phones, and enable Vodafone’s technical support to take temporary remote control over the device to resolve any technical problems. Vodafone is launching Red 4G-ready, bringing 4G to life as never before, kick starting the new season with over 150 hours of Premier League football or more than 20 million songs for music lovers. A ground breaking choice of content deals with Spotify and Sky Sports will give Vodafone customers first class 4G entertainment from £26 a month*. With unlimited UK data for the first three months, followed by double the data allowance available on standard Vodafone Red plans, plus unlimited talk and text, it’s Vodafone’s best value deal yet. Sports fan or music lover? Which would you choose? Vodafone Red 4G-ready price plans will be available in-store, online and by phone from 12 August, in time for the start of the new Premier League season, with a choice of Spotify Premium or Sky Sports Mobile TV. Vodafone Red 4G-ready customers choosing Sky Sports Mobile TV will have access to more live football than ever before, including exclusive live coverage of more than 100 matches from the Barclays Premier League, the Sky Bet Football League, UEFA Champions League, the SPL and La Liga. Vodafone customers choosing Sky Sports Mobile TV can also look forward to the fifth and final Ashes test in late August and the Ashes tour of Australia this winter, Majors golf coverage including the US PGA Championship, tennis action from the US Open and Heineken Cup rugby. Vodafone will launch Ultrafast 4G services in London on 29 August, with speeds typically six times faster than standard 3G. All customers on Vodafone Red 4G-ready, which is also available for small business customers, will automatically have 4G enabled when the service launches. ** After London, launches in Birmingham, Bradford, Coventry, Edinburgh, Glasgow, Leeds, Leicester, Liverpool, Manchester, Newcastle, Nottingham and Sheffield will come before the end of the year. Vodafone will bring indoor 4G coverage to 98% of the UK population by 2015. More than £900m is being invested in the network this year alone, and that comes after Vodafone spent £802m acquiring the widest portfolio of mobile spectrum in the recent auction. That portfolio includes the crucial low- frequency spectrum that means Vodafone’s Ultrafast 4G signal will travel further into buildings. Vodafone also picked up high frequency spectrum which is great for adding capacity where customers want it, such as in densely populated urban areas. Vodafone also owns more of its fibre backbone than other operators having acquired more than 20,500KM of fibre through the acquisition of Cable & Wireless Worldwide. Anyone on Vodafone Red who already has a 4G-ready device, can enjoy Spotify Premium or Sky Sports Mobile TV, double the amount of data they currently get and access Ultrafast 4G for just £5 extra a month, without needing to sign-up to a new contract with Vodafone. There’s a great value Vodafone Red 4G-ready deal for anyone who wants to enjoy great sporting action or their favourite music. All Vodafone Red 4G-ready 24 month, 12 month and SIM only plans come with either Sky Sports Mobile TV or Spotify Premium, plus unlimited calls and texts. They also come with Vodafone Data Test Drive, which provides unlimited data for the first three months, followed by either 2GB, 4GB or 8GB of data per month: that’s double the standard allowance available on Vodafone Red plans. Customers who already have a 4G-ready device and are looking for a SIM only deal can get Ultrafast 4G from just £26 a month on a 12 month plan. Vodafone Red 4G-ready is also available on 24 month plans, with a 4G-ready handset included, starting from just £34 a month and on 12 month plans, with a 4G-ready handset included, starting from £52 a month***. Vodafone already has a range of 4G-ready devices available today and more will be rolled out in the coming months. Check out vodafone.co.uk/4g for more information. Vodafone will also have a host of behind the scenes stories coming over the next few weeks on the Vodafone Social blog . There is a range of plans for customers who want to experience Vodafone Ultrafast 4G on their tablet, laptop or other device. Vodafone is offering the Samsung Galaxy Tab 3 (8 inch) for £31 a month with 4GB of data or for £36 a month with 10GB. The Sony Xperia Tablet Z is available for £37 per month with 4GB of data or for £42 per month with 10GB of data. Customers with a 3G device can purchase a 4G plan and benefit from the additional data allowance. Vodafone also offers a 4G dongle (the Vodafone K5006) for an up-front cost of £29 on a 12 month plan costing £20 per month that comes with 4GB of data, or for an up-front cost of just £9 on a 12 month plan costing £30 per month that comes with 10GB of data. Plans for just 30 days are also available. Customers with their own 4G-ready dongle can get Ultrafast 4G from just £20 per month, that comes with 4GB of data, or £30 a month for 10GB, on either a 30 day or 12 month SIM only plan. For customers who want to be able to share their Vodafone Ultrafast 4G experience, the Vodafone R212 Mobile Wi- Fi hotspot allows them to connect up to 10 Wi-Fi-enabled devices at once. It’s available for an up-front cost of £39 on a 12 month plan with 4GB of data at £20 per month, or for an up-front cost of just £19 on a 12 month plan with 10GB of data at £30 per month. Plans for just 30 days are also available. Content from Spotify or Sky Sports is not included in tablet, dongle or Mobile Wi-Fi plans. All customers on Vodafone Red 4G-ready will benefit from Vodafone 5 Star Care bringing them everything they need to get connected and stay connected – from the ability to back up all the vital contents of their phone and wipe it if it’s lost, to a replacement handset if their own is being repaired. With 5 Star Care, new and upgrading customers can quickly and easily transfer their stuff from their old phone to their new one with Vodafone RED Box, then keep a copy of all their important content on Vodafone Cloud. If they lose their phone they can instantly find, lock and wipe it with the Vodafone Protect online portal. And there’s even virus protection built-in. If the unthinkable happens and their phone starts playing up, Vodafone has an army of technical support experts ready to help in-store or on the phone. They can even take temporary control of a customer’s phone and help fix it remotely. If a customer’s phone does need more intensive care, Vodafone will lend them a smartphone while it’s being repaired. Vodafone 5 Star Care is available to all Vodafone Red and Vodafone Red 4G-ready customers. All Vodafone Red 4G-ready customers will be switched on to Vodafone’s 4G service when it launches. Vodafone will provide a state of the art coverage checker to ensure customers know where 4G coverage exists and where it is coming soon.